Cut-Out Top by Post December, Silk Skirt by Jayson Brunsdon (All available at Inverted Edge! ) Zara heels, Topshop jacket and shirt. As promised, this is Part II of my collaboration with online designer boutique Inverted Edge! I’m wearing a cut-out top by Korean designer Post December. It is definitely a bold piece but also surprisingly versatile. 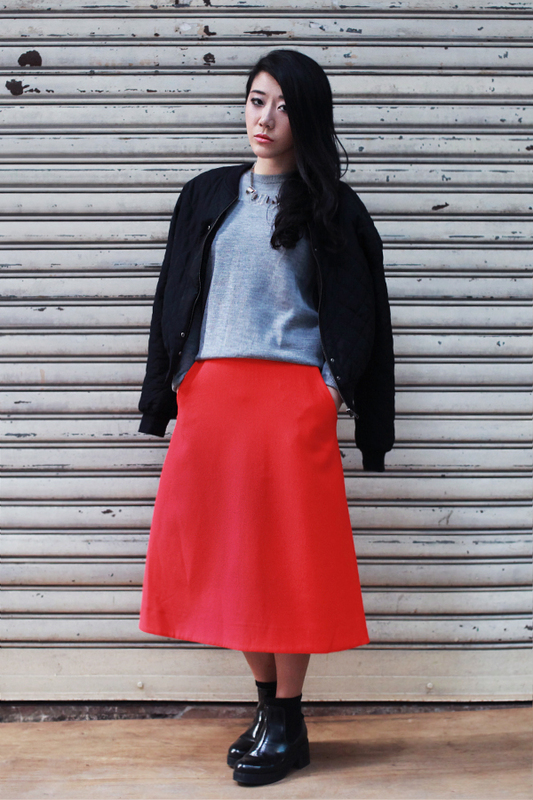 You can layer anything underneath the top and get that futuristic look instantly. And I’m so much in love with the beautiful sequin pencil skirt by Australian designer Jayson Brunsdon. It is the dream piece for me, and by that I mean if I am to be exiled to an far away island with only a few items, the skirt will still be on my packing list. 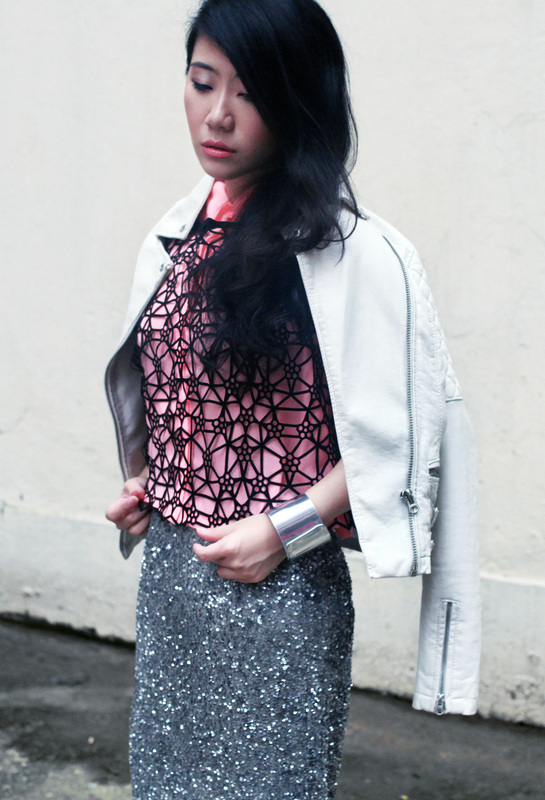 Hope you like my styling and now, win a chance to win the Post December top by entering my giveaway! Disclaimer: All items listed above are loaned, not gifted, according to my request. Giveaways are sponsored and handled by Inverted Edge. Zara top and shoes, Topshop skirt and printed top and clutch from local boutiques. If you bump into me on the street these days, I will most likely to be wearing something like this. My go-to outfit has shifted from flowy top and body hugging bottoms to lose-fitting top and structured bottoms and I’ve come to appreciate the simplicity in such combination. Vivid orange has always been my favorite color, it just brightens up everything. (Proof and proof). The black and white printed top and Zara heels put the whole outfit together. Simple and chic. Talk soon! Another simple fall outfit. Inspired by the dreaminess of Lana Del Rey x H&M collection. The grey embroidered top is of nice quality, but I kinda wish it’s more cropped and fits better with my high-waisted pencil skirts. The skirt is from H&M spring collection and boots are even older, both easily replaceable items. The gold necklace brings out the warmth in this outfit, making the look more fall-approprite. Hope you like it! Talk soon. Just a little update on what I’m wearing these days. I still can’t promise regular posting, but thank you for those who are still checking the blog! So, a few of my fall essentials – red Zara heels, quilted skirt from Topshop and my mom’s Bally bag which I borrow from time to time. It’s embarrassing but I don’t really know what’s trending now, what are you guys wearing this fall? Let me know and talk soon! Sorry guys, it’s been like a week without new posts. It was raining for a while but now we have officially entered the beautiful fall : D I can feel the cool air running through my palms, leaving behind a feeling that is so satisfying but somehow unsettling. But we all know that this is gonna be the one month in a year, when life is beautiful no matter what. Layering a shirt underneath a short-sleeve top is what I’d like to call the “librarian” look. It’s something I tend to avoid because with the wrong combination of textures, it will look extremely geeky and old-fashioned. It would take something heavy and chic like velvet to bring this look together, and I found just the right item in Zara yesterday! As I was strolling down the street, I noticed how people stare at my half-way tucked in shirt. Though I do think a little bit of messiness differentiates fashion bloggers from runway models, I couldn’t help but dwell on the line from The Picture of Dorian Gray – She tried to look picturesque, but only succeeded in being untidy. Hmm.. whatever. New hair and a new fishtail. I cut my hair! Can you see that? I know it’s not a dramatic change, but hey, one step at a time. Somehow the experience of going to a hair stylist resembles that of visiting a dentist: The interrogative question – What have you done to your hair/teeth, young lady? – which induces a lot of guilt, followed by a 4-hour treatment and a post-treatment trauma. This kinda explains why I haven’t visited a hair salon in 17 months : P You guys know me, I’ve had this long hair on one side since I started blogging. I was a but intimidated by the idea of changing my hair up. So DO tell me what you think about this! I figured a flowy top and a draped cardi would look very feminine and comfy with the skirt, and that’s exactly the mood I’m going for lately – as you can see. Thank you Sam for lending me the top, I really really like it! This outfit is inspired by the concrete backdrop of my city. 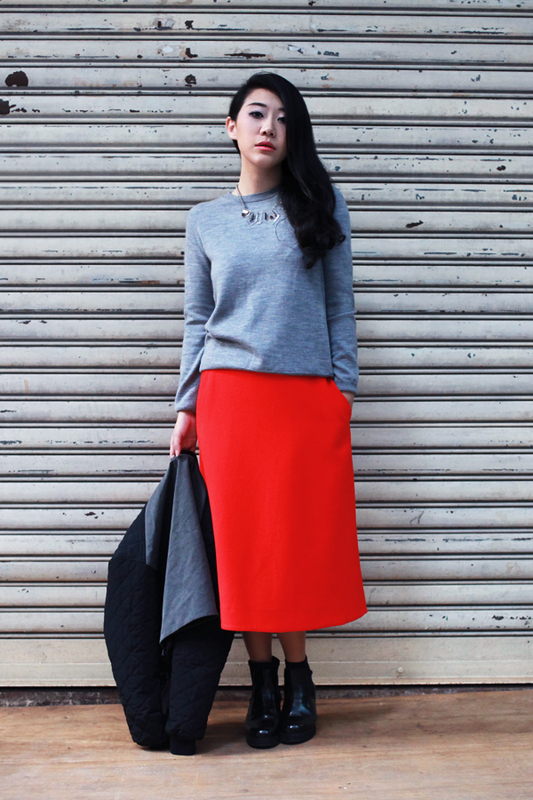 The two shades of gray make a good contrast with printed coppery skirt, and reflects the coldness of an urban landscape. The round drop shoulder jacket and the tulip shaped skirt added softness to the shape. (My odd outfit analysis is induced by an art history reading overdose, bear with me.) You might have spotted this Zara skirt from your local branch or on blogs, for me it’s a hit-and-miss because on one hand the print and the colour are so adorable. But on the other hand it’s kinda saggy and the length’s abit awkward. In case you are pondering on this, I’d say pass on this one : ( Or you may spot it later on my closet shop : P ! Trying out the new season’s jewel tone with this simple outfit. And.. the inspiration section is back!